Paste the following into a file, let’s say, named “Print to remote printer” and place it into ~/Library/PDF Services/. Obviously you need to exchange name etc for your proper parameters. I personally have two scripts, for two different printers. Make the script executable, e.g. using chmod 755. That’s it! 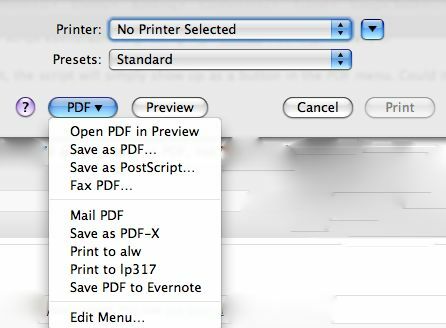 The next time you print a document, the script will simply show up as a button in the PDF menu. Could it be any easier? An added benefit is that your document will actually sent as PDF, not in a pixel format, so that should be relatively low on the network bandwidth, and certainly it’s not going to cost you more than any manual upload. If you have growl installed, then you may find the following script more useful instead. It automatically notifies you about whether or not the print job succeeded. growlnotify is a command-line tool that comes with the growl download package but is not installed by the default installer. If it’s not on your system then you need to install it using the script in the download package for growl.